As part of the Vision 2020 initiative, the Escambia County School District has selected a learning management system that has been branded CORE. This system will be a unifying tool for learners to access all district resources. Personalized learning empowers students with voice and choice in the learning process. It is a student-centered approach that is facilitated by the teacher based on each learner's mastery of the standards. A personalized approach will take into account each learner's unique learning style, abilities, and interests. It is built on the premise that learning happens anywhere, anytime, and in flexible learning spaces. 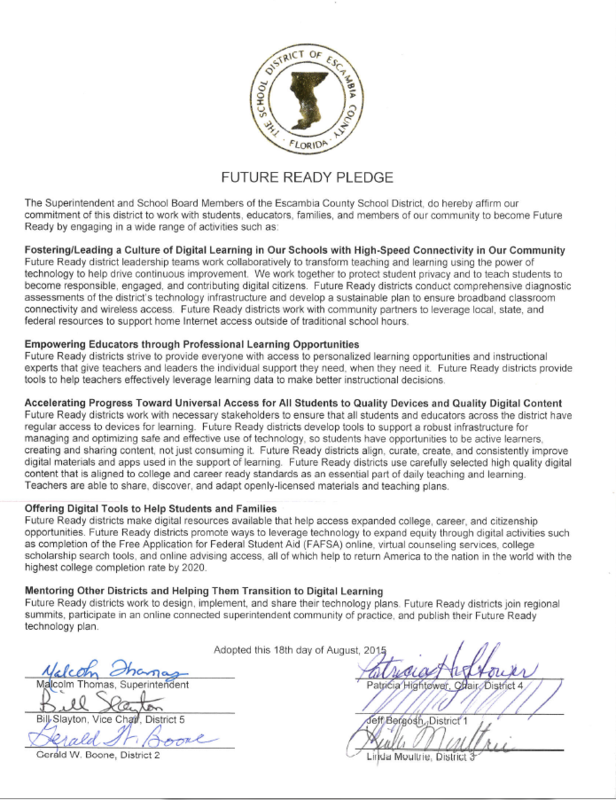 Escambia County School District used the Future Ready District Assessment to gauge our district's readiness to begin implementing digital learning. It included a series of questions designed to help us frame a vision for digital learning, recognize the elements of the Future Ready Framework, specify how technology can help align these efforts to achieve higher college-and career-ready standards, and understand the type of digital leadership required to stage our district for success.